Dynamic thiol–disulfide homeostasis plays a critical role in the cellular protection provided by antioxidation. 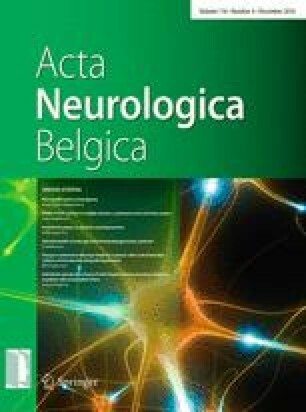 The aim of this study was to investigate whether there is a change in thiol–disulfide homeostasis in acute ischemic stroke patients. Patients diagnosed with acute ischemic stroke that had undergone magnetic resonance diffusion-weighted imaging within the first 24 h were prospectively included in this study. The thiol, disulfide, and total thiol levels were measured during the first 24 and 72 h, and the National Institutes of Health Stroke Scale (NIHSS), modified Rankin Scale (mRS), and Barthel Index (BI) of the patients were recorded. Overall, the relationships between the thiol–disulfide levels of the patients and the infarct volumes, NIHSS, mRS, and BI scores were investigated. In this study, 54 patients and 53 healthy controls were included. The mean of the native thiol levels in the stroke group was 356.572 ± 61.659 μmol/L (min/max 228.00/546.40), while it was 415.453 ± 39.436 μmol/L (min/max 323.50/488.70) in the control group (p < 0.001). A negative, significant correlation was observed between the infarct volumes and native thiol levels (ρ = −0.378; p = 0.005), and the disulfide levels were similar between the groups (Z = 0.774; p = 0.439). Significant difference was found between the thiol levels of the mild and moderate-severe NIHSS groups (p = 0.026). The changes in the thiol levels under oxidative stress may be associated with the severity of the stroke. Substitution of thiol deficiency and correction of thiol–disulfide imbalance may be beneficial in ischemic stroke. The authors state no additional individuals to acknowledge. This research received no grant from any funding agency in the public, commercial, or non-profit sectors.